Greeks are voting Sunday in a referendum on whether to accept the terms of a European Union bailout, which include further spending cuts. It remains unclear whether Greeks will vote for more economic austerity to get European bailout funds or reject EU demands and risk being thrown out of the eurozone. Surveys going into Sunday's snap poll show the vote is too close to call. Prime Minister Alexis Tsipras has urged voters to reject the conditions, which include more tax hikes and spending cuts. He says a "no" vote will give Greeks a better negotiating position with European Union finance ministers. To loud cheers from supporters, Tsipras arrived to cast his vote in a suburb of Athens. On the day of reckoning for Greece, he struck an optimistic tone. Greek voters must decide between the Prime Minister’s assurances that this is just part of the poker game with Europe and warnings from Brussels that a "no" vote could see Greece ejected from the euro. 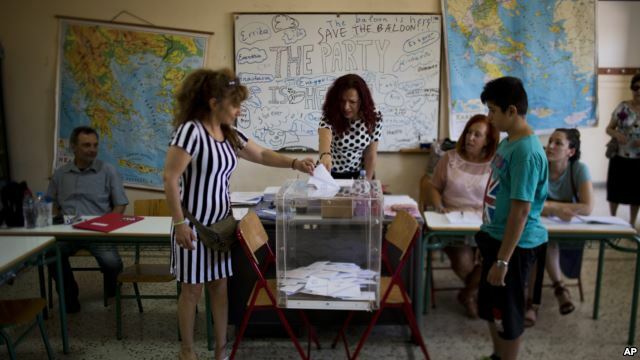 But among the steady stream of voters, many voiced fear over the consequences of Greece rejecting Europe’s offer. A woman said she was undecided until the last minute. She has two small children and is anxious for the future. “Though I am determined to make even more sacrifices for Greece to get over the crisis and have a better quality of life,” she says. But the "No" campaign says Brussels’ warnings of a Greek exit are just a bluff. Iasonas Liberis, an observer for the "No" campaign, said there are rules in the EU, and the EU is not the property of the technocrats. The democratic will of the people of Europe must be accepted. Greek Finance Minister Yanis Varoufakis accuses the EU of "terrorism" by trying to scare the Greeks into voting their way. But those in the "yes" camp say Greece has no choice but a European future. Being forced out of the eurozone means Greece would have to go back to using the old currency, the drachma - money that some outside Greece could refuse to accept. The week leading up to Sunday's referendum has been a miserable one for most Greeks. Banks put strict limits on withdrawals to avoid running out of funds, although ATMs ran out of cash several times. Supermarkets are fast running out of basic foods. Storekeepers are reluctant to restock shelves because of the uncertainty of how they would be able to pay for the supplies. Greece defaulted on a $1.8 billion loan payment to the International Monetary Fund last week when European finance ministers refused to extend its economic bailout. The Europeans accuse Athens of refusing to make any more economic reforms while the Greeks say they have sacrificed enough and feel enslaved to their creditors.